There are thousands of living languages in the world today, though many are on the verge of extinction and will be gone in twenty or thirty years. In a previous post, I talked about what the world’s top 20 languages were in terms of sheer number of speakers. Almost everyone in the world speaks at least one of these twenty languages. The interesting thing is there were quite a few languages on that list that are not widely known or learned, like Marathi, Wu and Javanese. Many would argue that, on a global level, these are not very important languages. Did they teach Wu at your high school? How many Marathi classes are taught in the world’s universities? So what makes a language globally important? This is an important factor, but in and of itself it is quite lacking. The Mongols ruled China but the Chinese retained their language and culture. The Germanic tribes sacked Rome but Italy, most of the Iberian Peninsula, Romania, Sicily and even France (whose very name is Germanic) all continue to speak Latin based languages. The Turkish speaking Ottoman Empire ruled most of the Arabic and Persian speaking world for hundreds of years but these places still speak Arabic and Persian. More recently, Russia forced its language on many places like Hungary, Estonia, Latvia and Bulgaria and the most impact it had was to promote bilingualism. This factor is very significant but often only creates short lived bilingualism. Egypt and Babylon were both ancient economic powers and yet their languages are now dead. The Turkic traders of the Silk Road were immensely wealthy but they all usually learned the languages of their clients. Japan is the second richest country in the world but you wouldn’t know it by counting the number of people who study Japanese, especially when compared to the number of people who study French, Italian and Spanish which are all languages that are associated with lesser economies. I’ve already touched on this one but I think this factor is worth mentioning again. Most Indian languages aren’t studied much outside of India. German is definitely an important language with many speakers and a powerful economy behind it but doesn’t really count as a global language since almost all of its speakers are in Germany and Austria. It’s interesting to consider Mandarin since it has many more native speakers than any other language and yet almost all of its speakers live in China and therefore limit the influence the language has on the world as a whole. 2. Who its speakers are. Bearing these two general factors in mind we can talk about what the true international languages are. Granted, these are not necessarily the world’s most important languages. What makes a language important is a rather subjective and highly personal matter. Greek, Latin, Chinese, Arabic, Hindi, Swahili and other languages have been used over wide territories for lengthy periods of time but I believe that French was the first language to be used by a huge number of people all over the world. Though WWI and WWII have tired poor France out her language continues to be spoken widely by around 250 million people in Europe, Africa, Canada and many small islands all over the world. French nineteenth century literature is still a must read and Paris is arguably the most popular tourist destination on Earth. Portuguese is not often thought of as a global language yet there are many more native Portuguese speakers than native French speakers. There are millions of them in the Americas, several countries in Africa and even in communities in places like China, India, Japan and East Timor. How is that for distribution? Brazil’s economy is the tenth largest in the world and the Lusophone African country of Angola is rich with diamonds, oil and coffee. Spanish, or Castilian, was first distributed all over the Americas during the conquests and colonization of the fifteenth through nineteenth centuries. It was reinforced by the immigration of the nineteenth and early twentieth centuries and is still being distributed today to places like Italy, Japan, Germany, Canada and the USA. Spain’s economy grows every day and the Hispanic population in the USA is an ever increasing economic force. The cheap labor in Latin America also makes knowing Spanish important because many companies choose to move their factories there. Popular Hispanic writers like Pablo Neruda, Gabriel García Márquez and Isabel Allende have helped spread an interest in the language as well as pop artists like Shakira, Paulina Rubio and Juanes. 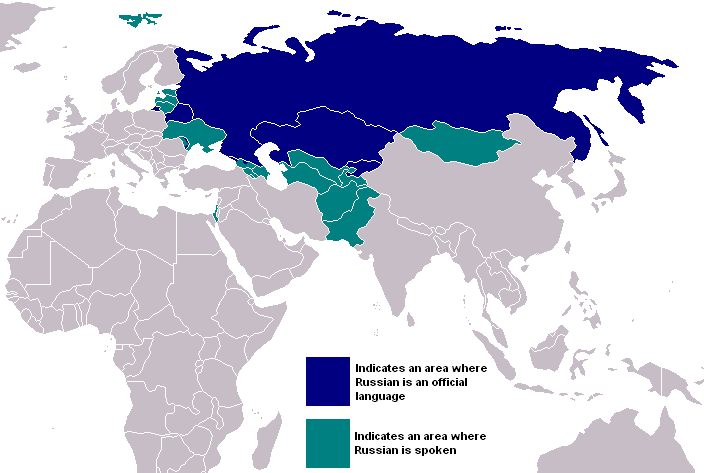 Russian is the main language or a very important language in almost all of the countries that used to be part of the Soviet Union. These countries are in Europe, the Middle East and Asia making Russian well distributed. Russian science and literature keep the language attractive to many people all over the world. It feels a little obvious mentioning English. With tens of millions of native speakers in three of the four quadrants of the planet and 1.5 billion speakers world wide, counting second language speakers, English is perhaps the most well distributed language ever. 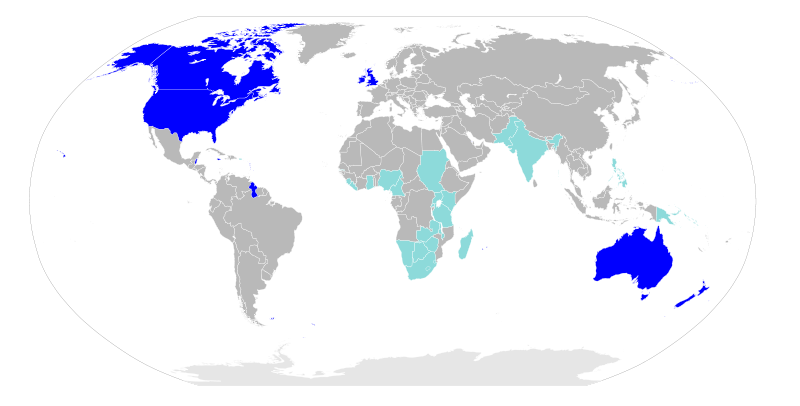 Canada, Australia, the USA and the UK are some of the most powerful countries in the world giving people plenty of incentive to learn English for monetary and diplomatic reasons. English language literature and pop culture are also found in just about every book store, library, movie theater, radio station and television station in the world. I would include Chinese and Arabic in this list if it weren’t for their many mutually unintelligible spoken varieties. A very large percentage of the international Chinese communities do not speak or understand Mandarin. Likewise, a street merchant from Algeria and a street merchant from Jordan will have about as much luck carrying on a conversation as a German and a Dane. Dutch and Esperanto are also languages that I would like to include for several reasons. They are both very well distributed languages, better than some languages that I included. Esperanto can be used to read literature from dozens of cultures and Dutch is associated with a very decent economic force. I decline to include them in the list of true international languages because of their lack of speakers. Dutch has twenty seven million and Esperanto only one million. You forgot another very important factor: scholarship. Although German has only the 9th or 10th most native speakers and never really had an empire, it is one of the most widely spoken 2nd languages in the world because of the vast amount of scholarly and literary works written in it. * the 3rd most popular language used by websites, after English and Japanese. I’m really interested in this topic. May I know where all those juicy references come from? I would love to explore that. Michael: Thanks for your comment. German is definitely an important language. No argument. I have a lot of German blood myself and would like to get around to learning the language. I have hard time seeing it as a global language though. True, lots of Europeans and quite a few Americans study it but it seems to pretty much trail off there. That doesn’t mean that it’s not worth learning though, obviously. Concise yet comprehensive look at the world’s top languages. Nice work! I’ve “Stumbled” this entry since there is a Linguistics category there. Regarding Michael’s comment…he obviously has a soft spot for German but from the stats I’ve seen, it barely makes it into the top 10 and its population of native speakers isn’t anywhere near as large as the languages in the top 5. Also, while it may be language no. 3 for English speakers, it’s a far number 3 and who knows for how much longer since the current foreign language that is drawing increasing attention and interest is Mandarin. There is a piece in today’s travel section of the NYTimes about a German-speaking enclave in Namibia. It is fascinating how they’ve been able to keep the language alive despite the extremely short period (only 30 years) of being a German colony. I suggest you to read this book : The Story of French, by Julie Barlow and Jean-Benoît Nadeau (La Grande Aventure de la Langue française, de Charlemagne au Cirque du Soleil). You’ll love it! Michael is right, though. German used to be the lingua franca of Central, Northern and Eastern Europe (not to mention the countless colonies of German-speaking emigrants in the Americas), and even used to be popular in Japan, which is still reflected by numerous words of German origin in the local languages. For academics, classical musicians, and lovers of literature, as well as Europeans in general, German is definitely an important language to know. (It is incredibly useful for those interested in Yiddish and Jewish culture, too – American English slang is full of Yiddish loanwords that German usually helps greatly to understand.) It is still among the top three languages used in scholarly literature, along with French and English, and was overtaken by English only sometime in the first half of the 20th century. Another language worth mentioning is Persian. While religious matters, especially the serious study of the Koran, make knowledge of Arabic indispensible, as regards worldly matters, Persian is even more important in the Islamic world, at least in Asia. And given that the area where it used to be an important (if not the most important) lingua franca par excellence, and still retains some degree of importance, spans a vast expanse within Asia, from Istanbul to Oman, from Russia (Kazan!) to India, and even into China, home to much more than one billion people, it should not be overlooked while looking for candidates of global or once-global languages. Additionally, Persian is not fragmented into countless mutually unintelligible dialects as Arabic is, and will appear considerably more familiar to those acquainted with European languages. Study of Persian is recommended to everyone with a serious historical interest, especially when these include the Islamic world, and Asia in general. Moreover, it opens up a cultural area that is markedly different from the one all the other languages mentioned so far are rooted in, and that has been tremendously important for many centuries and still is. A century ago, German and Persian would probably have been included in a list of global languages. While neither are of truly global dispersion, neither is Russian, which is featured in this list. Also their use in science and literature above other applications such as business parallels Russian, as well. Thanks for reading and, even more, for sharing your views. You make an excellent argument for why German would have been listed 100 years ago though I am surprised to learn that Persian was much more influential in 1910 than it is now in 2010. I would be very interested to know where you read that. I wonder what your reasoning is for saying that Russian is not a global language. If you look at the map I published in this post you will see that the language is used, either as a first language or a strong second language, by about a quarter of a billion people in eleven countries that cover Eastern Europe to the Far East. Just because a language is global does not make it significant to everyone on the globe. What do most Chinese care about French? Conversely, just because a language is not global does not mean that it is not important to a large group of people or worth learning, as you have so adeptly shown in descriptions of German and Persian. Italian and Japanese are two simply wonderful languages that no one has mentioned here. Even smaller languages like Thai, Danish and Macedonian, have much to offer to those willing to read their literature or live among their people. About the influence of Persian I have, strictly speaking, not so much actually read any direct assertions to that effect, but made my own conclusions based on the fact that it is only in the last century that Russian has become the international or inter-ethnic lingua franca in Central Asia and the Caucasus, Hindi/Urdu and English in South Asia, and Turkish in Anatolia. When I look for the language that must have preceded it in that role the obvious choice is Persian: the language of high culture in the Ottoman Empire (large parts of the Caucasus being under either Ottoman or Persian control long into the 19th century), with an overwhelming influence on Ottoman Turkish, the language of the Mughals, and still an important language of higher culture in Pakistan, and moreover, the former common vehicular language in Central Asia. It’s not easy to find direct assertions about language use in Asia in history, though, and I haven’t seen any systematic portrayals yet (though admittedly, I haven’t really searched the scientific literature). Clearly, the presence of countless borrowings from Persian and (clearly conveyed through the medium of Persian) Arabic in Turkic, Caucasian, and related Indo-Iranian languages attests to the former importance of the language. I must clear up a misunderstanding: I have never doubted or even denied the status of Russian as a global language. The only aspect I’ve pointed out is the fact that its distribution is not truly global (scattered emigrant groups excluded), and largely confined to Northern and Central Asia and part of Eastern Europe. I’ve only brought this example up to vindicate the status of German and Persian as (once) global languages even though their distribution is and was similarly restricted (although the presence of German-speaking colonies throughout the Americas in the early 20th century, and to a lesser extent still today, is a notable fact). By the way, I would also defend the inclusion of Arabic and Chinese in this list. The presence of numerous strongly divergent varieties is in both cases no actual hindrance in practice (generally speaking), as standard varieties (Modern Standard Arabic and Standard Mandarin, respectively) are familiar to most speakers of Arabic or Chinese varieties. So if you interpret ‘Arabic’ to mean ‘Modern Standard Arabic’ and ‘Chinese’ to mean ‘Standard Mandarin’, there is no reason that prevents their inclusion in a list of global languages. Languages such as Greek, Latin, Aramaic, or Sanskrit (or in the Middle Ages, Occitan and Low High German) also had a remarkable status as languages of international communication in the past, but they are probably too far removed historically to even consider them for inclusion. However, Ecclesiastical Latin, Church Slavonic and Pali still retain a certain importance in religious contexts. While I do not intend to address the issue of languages such as Italian or Japanese, because even though in the past they did have some supra-regional importance as evidenced by borrowings in languages sometimes quite far afield (especially in the case of Japanese influence in the Pacific), or even Thai (whose influence, as far as I am aware, has never significantly exceeded the current borders of Thailand), it is interesting that you would bring up Danish, as it has exerted influence in a geographically expansive area, spanning from Greenland and Iceland, through the Faroes, to Norway in addition to the native Denmark and the historically Danish-ruled and still (in a technical sense) Danish-speaking Southern Sweden. I’m American. I speak English, Spanish and French fluently and have passes for native in Spain and France. I am currently learning Russian. I already plan to learn Arabic after achieves a high level in Russian. However, I am at a lost for my 6th language choice. My cousins speak Flemish and I can’t choose between Flemish, German, or Chinese. Its such a hard choice because I learn languages for fun not practicality or employment opportunities. If you learn languages for fun, and are looking for a real challenge, neither Flemish/Dutch nor German are going to satisfy you, I think, because neither is exotic from the point of view of an English speaker, in fact they’ll turn out looking quite familiar. Then, Chinese is the way to go. If you learn for cultural interest, German and Dutch are very advisable, too, however. You’ll have to decide depending on whether you are ready and able to devote so much time to learning a new language when you start your 6th one – spoken Chinese isn’t actually that hard I hear, the tricky and time-consuming part is learning a new character for every new word, basically. is persian a local or global language? If you follow Ostler’s criteria (see above) then Persian is just can’t count as a global language. I recognize that there are pockets of Persian speakers all over the world but that’s all they are, pockets. It is, however, a very important regional and historical language.